Last October, hundreds of Providence residents, as well as city employees and elected officials, participated in the week-long kickoff of Providence Tomorrow, a neighborhood planning and growth process that showed that regardless of neighborhood, income or race, Providence residents support the move into the 21st century by making Providence a more urban, more walkable, transit-oriented city, while upgrading the quality of life in the neighborhoods and preserving what is special about their communities. Over five hundred comments have been made on the Planning Department’s website regarding the Comprehensive Plan, and public hearings on the subject have been well attended. Providence is poised to continue its evolution as a renaissance city, and Providence residents, businesses, and employees are interested and excited about being a part of shaping the vision of Providence’s future. However, last week, something happened to derail Providence’s diligence and served to remind us all of why we want change in the city. While the City Planning Commission (CPC) voted to continue a request to abandon a portion of Bradford Street, a viable city street, for a large scale building project dubbed Vista Della Torre, just an hour later, in a move that may prove to be legally questionable, the City Council Ordinance Committee voted to approve the abandonment without the necessary recommendation from the CPC. 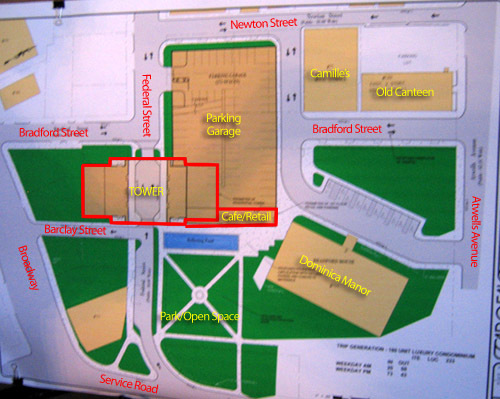 Greater City Providence opposes the abandonment of any portion of Bradford Street. Bradford Street serves as a vital north-south connector in a neighborhood with high traffic and few north-south arteries. Bradford provides a connection from Downtown via West Exchange Street to Atwells Avenue and Broadway. The street is also one with great potential for dense development in this area so close to Downtown. Closing the street provides roadblocks to future development along the street. The traffic plan proposed by Garofalo & Associates for the Vista Della Torre on Federal Street does not serve the residents of the neighborhood or the city at large. The abandonment of Bradford Street and making Federal Street one way will displace traffic to other areas such as Dean Street, which already sees a very high level of traffic and presents a hazard to pedestrians in the area, and will most likely negatively affect businesses at the end of Broadway. Federal Hill has already lost several streets (and housing stock) to abandonments which never served the public, but instead are used for parking. These issues and others need to be addressed before permission is given to abandon a public street. While Greater City Providence does not reject the concept of a tall, important gateway building project for this location outright, a lot of unanswered questions remain, and the current design of the building and the site plan is unacceptable. If street abandonments at the City Plan Commission or City Council level are the only public input for a project of this size, then it behooves us to fight that battle where we can. One of the unfortunate lessons of the past has been that you cannot “unring the bell” – street abandonments cannot be taken back when the developer’s project falls through or changes drastically. Providence has seen entirely too many of these projects fast-tracked with little or no public comment; the details of which are often worked out on the sly, benefiting not Providence as a whole, but merely a few individuals whose commitment to the City’s vision and quality of life may be suspect at best. We encourage you to contact your elected officials to voice your opinion about this project and specifically the abandonment of Bradford Street, which may be voted on by the full City Council as soon as next week. Please contact your City Council person, and Ward 13 Councilman John Lombardi about the street abandonment. Please contact the Mayor to ask why this project is moving through the approval process so fast, with so little chance for public input, and without the proper approvals by the proper agencies in the proper order.